The current Urban Design Guidelines for Victoria and Apartment Design Guidelines for Victoria are now the relevant policy guidelines for higher density residential development within the State Planning Policy Framework of the Victoria Planning Provisions. The Victoria Planning Provisions were amended to require consideration of the Urban Design Guidelines for Victoria, and Apartment Design Guidelines for Victoria, where applicable, in the design and assessment of new development proposals. 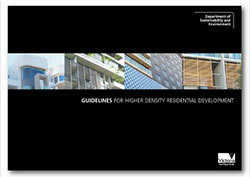 To view the superseded Guidelines for Higher Density Residential Development select the links below. Due to file size the guidelines have been provided in three separate files.